The Best of Evangelical Scholarship on the Old Testament! The New International Commentary on the Old Testament has proven itself as an indispensable guide for understanding and applying the Old Testament Scriptures. It offers a wonderful combination of scholarship and life application. This premier commentary series enjoys a worldwide readership of scholars, pastors, and serious Bible students. They eagerly consult its high-quality volumes to inform their preaching, teaching, and academic research, and they warmly welcome each newly published volume as they would an encounter with a stimulating new friend. Through the rigorous yet reverent study contained in these commentary volumes, readers hear afresh the voice of the living God speaking his powerful word. Readers who want to hear God's voice anew through Scripture will find The NICOT to be a faithful, trustworthy guide for understanding and navigating the Old Testament. This is a very well written and researched set of commentaries. Some of the best Old Testament scholars have done a great job to balance the academic and the practical application of Scripture. To have such a resource available at a reasonable price is excellent. 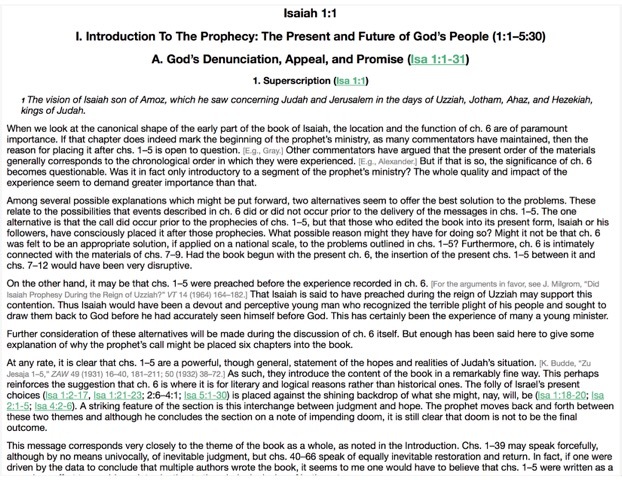 Although NICOT has Exodus (https://www.amazon.com/Exodus-International-Bible-Commentary-Testament/dp/B002K5BOLM) it is not in this set. Nor is Daniel included or 2 Samuel, etc. NICOT, like NICNT, goes into great detail and not always on the main spiritual point. It tends to get lost in minor points. However, sometimes those minor points are still very important, and the detail in NICOT and NICNT is wonderful when it's that for which you are looking. The New International Commentary NT set is an amazing and in-depth tool that should be available to any student, teacher, and preacher of the word of God. Thankfully, ESS is able to make this a reality by offering the digital package at such a reduced price that preachers and pastors all around the world can access its helpful insights. Thank you so much! This is a very thorough collection at an unbelievable price. There is no guarantee any collection will have all great books but the NICOT has a very scholarly collection with few books that are not excellent. You won't go wrong if you are looking for a complete set. This is an in-depth scholarly commentary. I have found it to be an excellent resource when you want to go very deep into the text and of course it’s also a valuable resource if you are enrolled in formal bible education. The NICOT/NT series has been a blessing to my Bible study and sermon preparation. It is not too technical yet contains the necessary information I need to know. In most cases it addresses the questions I might have. I have owned and used some hard copies of the NICOT series. At this price, it allows me to collect the whole set. I use eSword everyday. With this set at my finger tips, it adds to my resources in a convenient way. As a rule I prefer not to buy commentary sets, especially by multiple authors, since the work is generally inconsistent and one ends up with a number of good volumes mixed in with bad ones. The NICOT is an exception, as is the NICNT. thankfully, both sets are offered by eStudySource, and both sets are worth the price, especially the terrific prices offered here. No e-Sword user should pass them up. This is an excellent compilation of commentaries for a great price. The price was 70% less than the best deal on this set I was able to find. Thank you for making such a great resource so available. The NICOT is definitely the best for an in-depth understanding of Scripture. I immediately purchased NICOT when it was offered by estudysource.com for three reasons: (1) It will complete my already purchased NICNT which is also available with estudysource.com; (2) It is worth your investment for spiritual growth and you will never regret purchasing this awesome commentary; (3) It is a lot (and I mean, A LOT) cheaper than those who offer the same package on different software. With this offer, I can appreciate how solid and scholarly the commentaries are written, and gives a deeper insight on the verses that I am studying, even on a tight budget. I am now more inspired to study and learn about what God wants to reveal to me by His words, and these commentaries (NICOT and NICNT) surely is a wonderful tool to help me on my journey. This set has long been known to be an excellent asset to anyone studying the Bible in depth. As an Adult Sunday School teacher, I have purchased several of these books to aid my study over the years. It is really great to have all of them as an e-resource and connected directly to various Bible versions. I love the E-Sword platform and its versatility and now to have all the NICOT book studies literally at my fingertips...Heavenly! Thanks for continuing to add exemplary resources to this platform. I am very happy with this product and this company. I have ordered from this company many times and they are great to work with.